Holyrood Palace lays to the North of one of Edinburgh's most famous landmarks, Arthur's Seat. The palace and the abbey behind it are approached from the West along either Holyrood Road or Canongate both streets lined with some of Edinburgh's finest buildings. 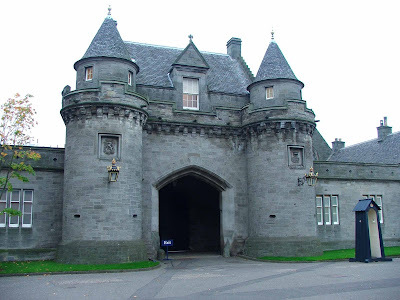 The palace consists of an impressive complex of buildings dating from various periods, and now used as the official residence of the Queen when she's visiting Scotland. Facade of the palace, showing the North and South towers. In 1128, King David I was hunting in what is now Holyrood Park, when he was attacked by a stag. As the animal confronted him, he had a vision of a cross, or a 'rood' between its antlers. He believed he was seeing a representation of a relic of the cross of jesus that his mother Queen Margaret had in her posession. He survived the confrontation, and whilst sleeping the next night, had a dream where he was told to build an Augustinian monastery on the spot he had seen the stag. A guest house was also built on this site, to accomodate the monastery's many visitors. 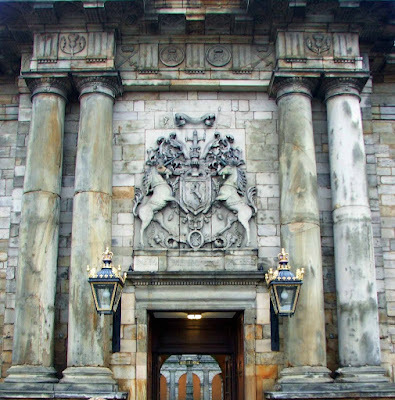 In 1501, King James IV of Scotland built a Royal palace on the site of the guesthouse....and from this time on, Holyrood as it had become known, became the official residence of Scottish kings and queens. The palace also assumed the role of official residence of the English monarchy after the union of the crowns in 1603. The new palace contained a new chapel along side the monastery, seperate living quarters for both the king and the queen, a hall and a gallery. A gatehouse was also added to the complex at this time, fragments of which are said to survive in the Abbey courthouse. 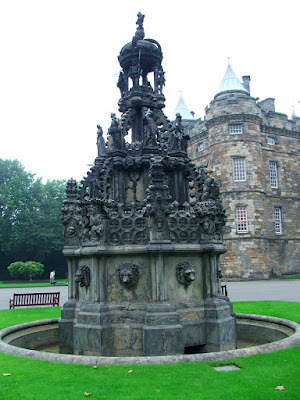 Replica of Linlithgo Palace fountain. Between 1528 and 1536, James V of Scotland extended the palace, adding a new north western tower and a new facade to the west frontage of the palace. The new tower was later to become the apartments where Mary Queen of Scots, his daughter, would spend much of her time after her husband, Francis II of France died. It was in this tower that David Rizzio, whom Mary's husband Lord Darnley believed Mary was having an affair with, was murdered....in front of Mary. In 1567, after Mary's husband Lord Darnley was murdered, Mary married her lover James Hepburn, 4th Earl of Bothwell at Holyrood Palace. Later that year, Mary was imprisoned on the orders of Elizabeth I of England. She was never able to return to Holyrood palace again. In 1603, upon the union of the crowns, James VI of Scotland also became James I of England. He moved to his new court in London. He visited Holyrood once more in 1617, and the palace then ceased to be the home of the royal court. In 1633, Jame's son, Charles I was crowned at Holyrood Abbey. It was probably this occasion that prompted Charles to order the refurbishment of the palace, and it was brought back into royal favour. In 1646, Charles gave the title of Keeper of the Holyroodhouse to the 1st Duke of Hamilton and his heirs....a title that has been passed down the generations. The Duke's descendants still hold apartments in the palace even today. In 1650, during the years of Oliver Cromwell's Commonwealth, the palace was home to a garrison of troops from his New Model Army. It was during this time that the palace was damaged by fire. At Cromwell's death, and the demise of the Commonwealth under his son Richard in 1661, Charles II was crowned in Scotland. Between 1671 and 1679, Charles ordered that Holyrood palace be reconstructed and repaired. When the work was done, it became the residence of Charles' brother James, Duke of York, later to became James VII of Scotland, and James II of England. Main entrance to the palace. In 1707, the title of King of Scotland ceased to exist under the Act of Union which united the English and Scottish parliaments in a new United parliament. The palace was hence used for the election of Scottish peers to the new British parliament. In 1768, the roof of the Abbey church finaly collapsed after years of neglect. No repairs were ever made, and the church stands today pretty much as it did then. In 1822, the palace was again rennovated, this time for the visit of George IV. King George also ordered that the state apartments that had belonged to Mary Queen of Scots should be preserved. During the 1830's the palace was used as a palace of exile for the Compte de Artois who was the younger brother of Louis XVI, whilst France was going through its revolution. He stayed at the palace for two years, leaving in 1832 for permanent exile in Austria. The palace didn't recover its title of Royal residence again until 1842, when Queen Victoria made her first visit. In 1922, further rennovation work was carried out, this time to bring the palace into the 20th century. Running water and electricity were two of the utilities added at this time. If you visit, I'd strongly suggest not just looking around the grounds of the palace and the Abbey next door. The interior is fascinating too, and contains many items once in the possession of Mary Queen of Scots, as well as other members of the English and Scottish royal families.